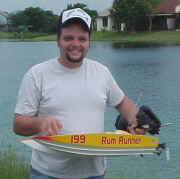 The Rum Runner Offshore Catamaran. In the US N.A.M.B.A. racing, the offshore class was created as an experiment by the members of Central Florida High Voltage Club with the hope of offering a new creative and spicy boat class to USA racing. The plan was that any hull or power system could be used as long as the boat has a scale appearance to a real Offshore racing power boat. The class requires that the boat be a minimum of 31 inches in overall length and have 12 cells for power. There is no restriction on the motor or any other aspect. Originally, the intent was to create a scale class for Enduro racing. However it seemed like to much to ask for both a new class AND a European style Enduro event. So for now, we are thankful for small gains. What I liked about the class was first, the size. Second the scale appearance without any restriction on hull design. This allows for creativity, skill and competition. When I decided to join in the fun, I had a hard time finding a hull that fit my requirements. So I borrowed a mold for a patented towing model that my grandfather had designed for use in a towing tank. Towing tanks are used for design development and refinement by naval architects. 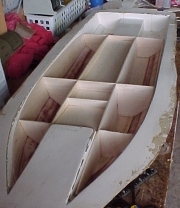 I prepared the mold and began the hull assembly process. I used a high-tech epoxy and fiber glass cloth to lay-up the hull. It took a dry run before I learned how to use the epoxy and keep the boat light enough for a fast electric model. Once the epoxy had cured, I removed the hull from the mold and trimmed the edges to reduce the overall length to 28 inches. After trimming the hull, I reinserted the hull into the mold. 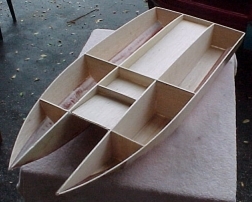 This would hold the shape while inserting the stringers and bulkheads. The process took several days to complete. The stringer system also doubled as the shape for the deck and motor wells and battery compartment. Since my goal was to be as real in appearance as possible, I wanted to have two motors and a couple set of running hardware. The question was, how do you do that? 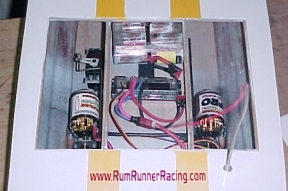 Fast Electric racing boats do not often have two motors, two drives systems, and two props. After speaking with Ed Hughey of Hughey Boats, I decided to do something different. That was to install dual gear boxes with 05 motors. However I used a separate gear box in each hull. That meant I would end up with two props driving my boat. Sounded good but could I over come any Torque related problems? This took some doing and was difficult. The good news is it is possible to manage the excess Torque that dual props produce. Interesting! 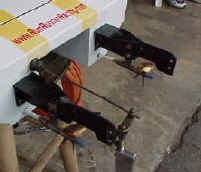 Once I had the gear boxes mounted I had to decide on Struts and running hardware. After looking around and not finding what I wanted I decided to build our own struts. We had to create struts that hung behind the boat at least 3 inches to get the props into "clean" water. Also I had to extend the length of the boat to make it 31" overall. So I used sheet carbon fiber and cut it into our desired shape. Instead of using a piece of angled aluminum to attach the struts to the stern, I decided to construct the whole thing out of Carbon Fiber. Additional bracing was needed in order to keep the carbon fiber from flexing with the torque of the pops. Next was the rudder. I decided to use two rudders on the back of each strut (behind the props). I hooked them both up to one Hitec servo. But, after testing the boat a few times I had to take one of the rudders off due to prop torque. The struts were flexing so much that I had to eliminate one rudder to stop drag. I've switched between flat rudders and wedge rudders and our CAT seems to like the wedge rudder best! Now its time for the Real Fun! We have been very happy with the performance of our CAT. It turns great and accelerates extremely fast. The design of the hull creates a lot of lift. On a windy day I have to be careful not to "Fly" the boat, because she will FLY! But this lift is a major advantage on normal days. It helps keep the boat right on the "sweat spot" of the running surfaces. I am very pleased with the handling & speed. Stay Tuned! I'd like to thank my grandfather Don Wollard, Sr. for his help building this boat. His years of boat building experience shows in this Catamaran's design. He is also going to help us re-design this hull next year to maximize it's potential for Fast Electric boating. Watch for updates!